Wildfires can add huge amounts of carbon dioxide (CO2), carbon monoxide (CO), methane (CH4), nitrous oxide (N2O) and black carbon (BC or soot) into the atmosphere. While CO and soot are not included as greenhouse gases by the IPCC, they can have strong warming impact. CO acts as a scavanger of hydroxyl, thus extending the lifetime of methane. BC results from biomass burning, which a study by Mark Jacobson found to cause 20 year global warming of ~0.4 K. Moreover, BC has a darkening effect when settling on snow and ice, making that less sunlight gets reflected back into space, which accelerates warming. This hits the Arctic particularly hard during the Northern Summer, given the high insolation at high latitudes at that time of year. The image below shows fires around the globe on August 12, 2016. 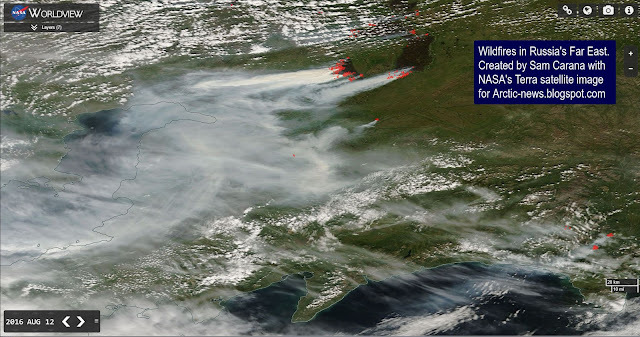 Visible in the top right corner of above image are wildfires in Russia's Far East. The image below zooms in on these wildfires. The image below shows carbon dioxide levels as high as 713 ppm and carbon monoxide levels as high as 32,757 ppb on August 12, 2016, at the location marked by the green circle, i.e. the location of the wildfires in Russia's Far East. As said, wildfires can also emit huge amounts of methane. 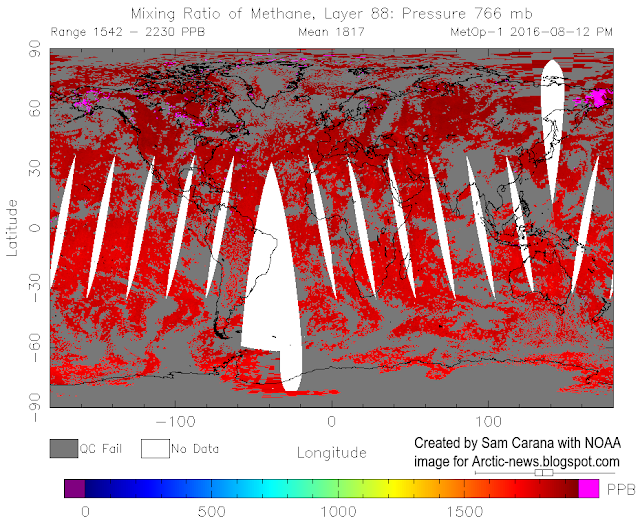 The image below shows methane levels as high as 2230 ppb at 766 mb. The magenta-colored areas on above image and the image below indicate that these high methane levels are caused by these wildfires in Russia's Far East. The image below shows methane levels as high as 2517 ppb at 586 mb. Methane levels as high as 2533 ppb were recorded that day (at 469 mb), compared to a mean global peak of 1857 ppb that day. 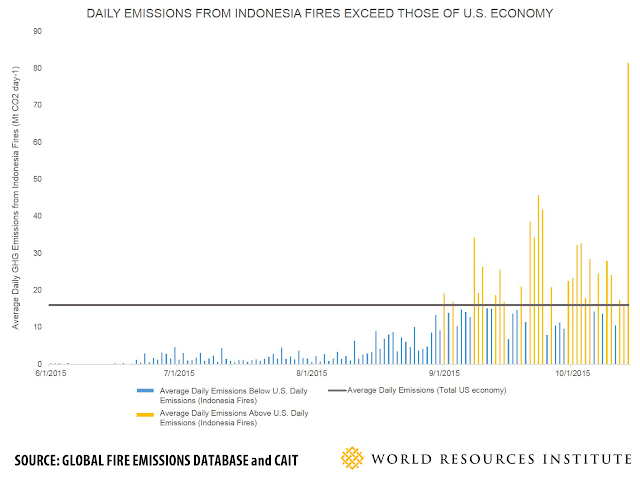 Analysis by Global Fire Data found that the 2015 Indonesian fires produced more CO2e (i.e. CO2 equivalent of, in this case, CO2, CH4 and N2O) than the 2013 CO2 emissions from fossil fuel by nations such as Japan and Germany. 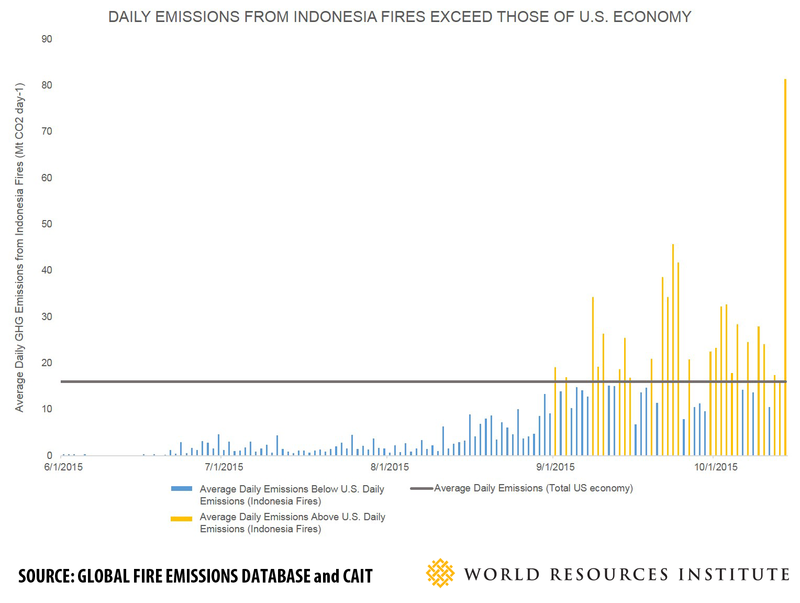 On 26 days in August and September 2015, emissions from Indonesian fires exceeded the average daily emissions from all U.S. economic activity, as shown by the WRI image below. A recent study calculated that Indonesia’s 2015 fires killed 100,000 people. Methane emissions from wildfires can sometimes be broken down relatively quickly, especially in the tropics, due to the high levels of hydroxyl in the atmosphere there. Conversily, methane from wildfires at higher latitudes can persist much longer and will have strong warming impact, especially at higher latitudes. Similarly, CO2 emissions from wildfires in the tropics can sometimes be partly compensated for by regrowth of vegetation after the fires. However, regrowth can be minimal in times of drought, when forests are burned to make way for other land uses or when peat is burned, and especially at higher latitudes where the growth season is short and weather conditions can be harsh. Carbon in peat lands was built up over thousands of years and even years of regrowth cannot compensate for this loss. A recent study concludes that there is strong correlation between fire risk for South America and high sea surface temperatures in the Pacific Ocean and the Atlantic Ocean. This makes the current situation very threatening. As the image below shows, sea surface temperature anomalies were very high on August 12, 2016. Above image also shows that on August 12, 2016, sea surface temperatures near Svalbard (at the location marked by the green circle) were as high as 18.9°C or 65.9°F, an anomaly of 13.6°C or 24.4°F. 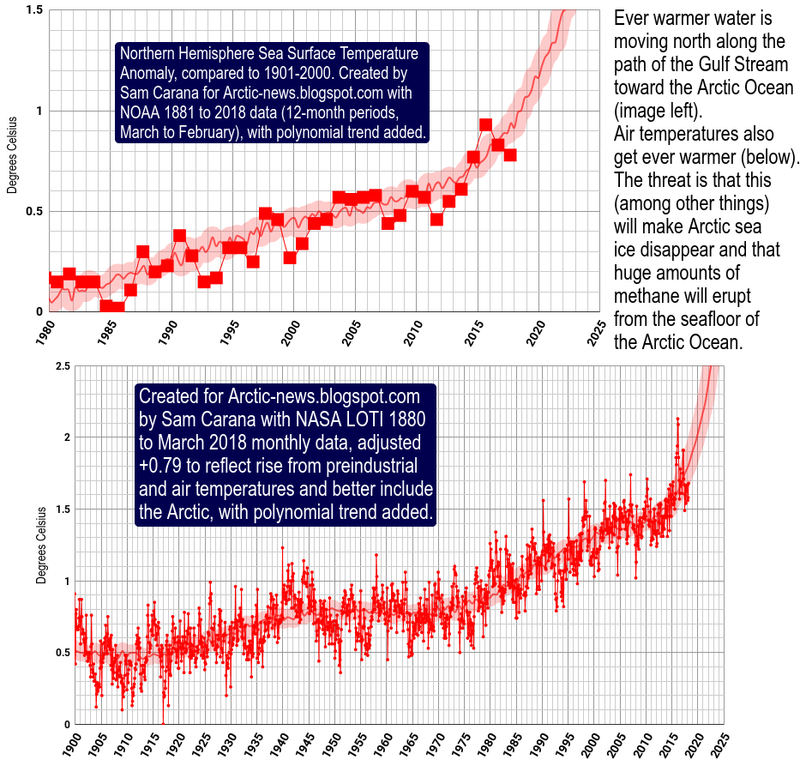 These high temperatures threaten to melt away the Arctic's snow and ice cover, resulting in albedo changes that accelerate warming, particularly in the Arctic. 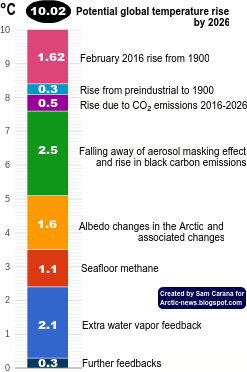 Warming of the Arctic Ocean further comes with the danger that methane hydrates at its seafloor will destabilize and make that huge amounts of methane will enter the atmosphere. Earth is pretty far along into extinction acceleration and root core snap to hot side of region where liquid-water is normal for Type M planet..